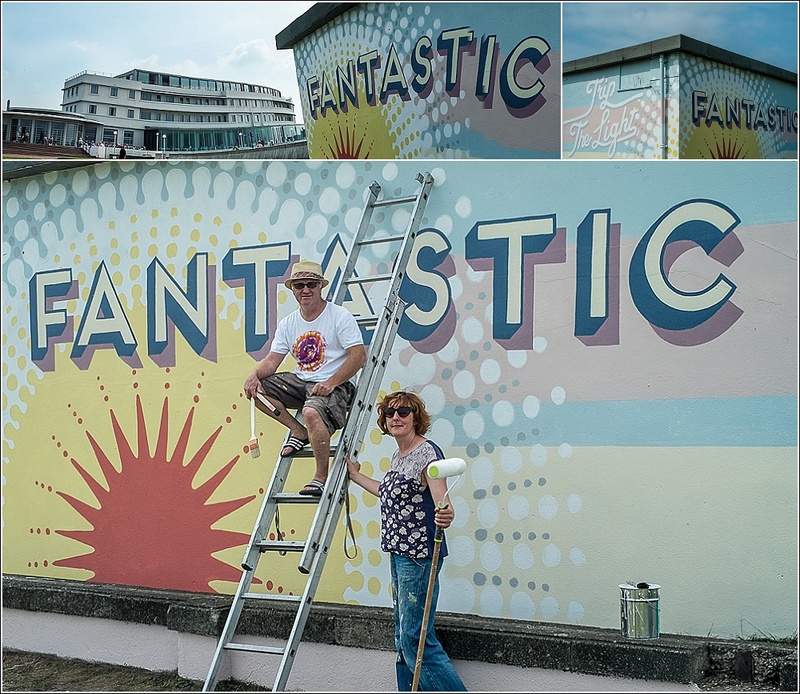 Yesterday I had the pleasure of snapping two friends at work on a “Fantastic” public art project that is reshaping our vision of Morecambe. Shane and Kate have been working with creative events consultancy “DecoPublique” to revitalise parts of old Morecambe. Recently they brought back to life the old Palladium Cinema sign on Morecambe’s Marine Road (opposite the Eric Morecambe statue). Currently they are painting the old electricity block on the Stone Jetty behind the Midland Hotel with a stunning piece that harks back to the old graphics of bygone Morecambe in it’s Heyday! And this weekend it will be unveiled to the throngs of visitors who are expected to attend the Vintage By The Sea Festival, organised by Wayne Hemingway. Do come and see it (and learn about the next piece they will be working on), enjoy the festival, Trip the Light Fantastic, and don’t forget to tweet/update all about #fantasticmorecambe !! Read more about the artwork on the Deco Publique website.